Infotec was awarded contract GS-35F-0001R through the General Service Administration Federal Supply Schedule 70 providing our customers rapid access to a wide range of training services inclusive of instructor-led, remote training, virtual training, and e-learning courses. The General Service Administration has reviewed the firm’s capabilities, negotiated rates, and prequalified Infotec to provide the services listed within the GSA schedule significantly reducing the time required to obtain the services. 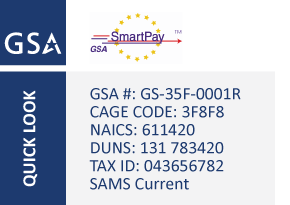 Purchases can be made with a SmartPay card, Blanket Purchase Agreement (BPAs), Basic Ordering Agreements, and Master Ordering Agreements (MOAs). Infotec has established partnerships with strategic government contractors to position our course offerings through other contract vehicles, as well as, through partnerships with small business 8(a) providers. In addition to special course-by-course rates on the GSA schedule, Infotec holds a GSA Value Card option for volume purchases. The GSA Value Card provides an additional discount and flexible solution for agencies to lock in their training budget for 12 months offering a great means to maximize your annual training dollars.